Anagha Asok and Padma Priya.S from Amrita School of Engineering, Coimbatore was awarded a consolation prize in Phase 1 of Texas Instruments Innovation Challenge India Analog Design Contest 2014 for their project titled ‘VIRTUAL MOUSE’, mentored by Mr. Adarsh, Faculty of Electronics and Communication Engineering. A total of 365 projects from 165 colleges competed in Phase-1, a panel of reviewers evaluated all the entries on various aspects such as satisfying the rules of the contest, novelty/innovation, completeness, innovative use of analog components, attention to system optimization, quality of the final report and video demonstration; among which 19 projects were declared winners and 29 projects were awarded consolation prizes. As consolation prize winners, they were awarded with Phase 1 consolation winner’s certificates and a cash prize (equivalent of USD 200) in a colorful award ceremony that was organized as a part of TI India Educators’ Conference (TIIEC 2014) at TI India Bangalore Campus held on April 4 and April 5, 2014. The conference was held in cooperation with IEEE Bangalore section and the Bangalore chapter of IEEE Circuits and Systems society. It provided a platform for the participants to show case their projects in the form of paper presentation, followed by five minutes technical question and answer section. The proceedings of the conference were published in a CD-ROM which was distributed at the conference. Apart from this, they exhibited a demo at TIIEC 2014 packed with interminable interactions with industrialists for two days. 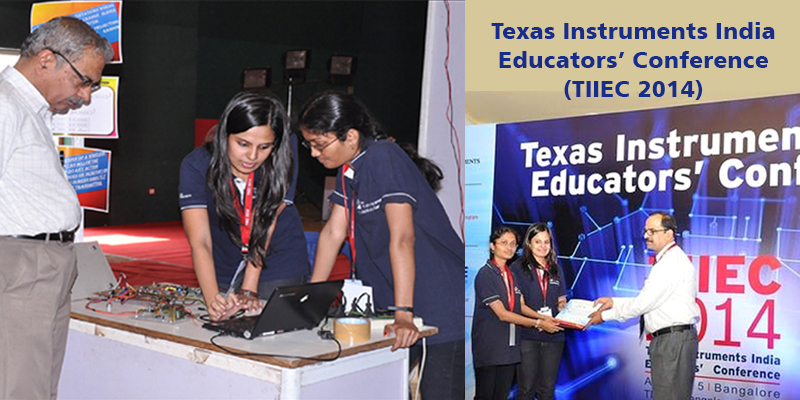 TI India University program served its goal best by bringing the educators and the industrialists on the same platform. The projects presented touched so many application domains - alternate energy, home automation, security, safety, instrumentation, healthcare and robotics to name a few.”Virtual Mouse” categorized under instrumentation makes the presentations easier by providing ‘mouse arrow in our hand’. It is a wireless system which can allow the presenter to do any action (that mouse does on a desktop) on the projected screen directly with a pen like transmitter. The system consists of three main parts: a sensor strip (receiver) and the virtual pen (transmitter) and a PC interfacing part. The waves sent by transmitter are received by the receiver and the point of clicking is captured by analyzing the digital value (computed using ADC technology) of sound waves received by receiver. The mouse action at the point is carried out. Also clicking action is performed with the help of an Infra Red LED and photodiode detecting the 'ON' stage of photodiode as a click. The design will help the presenter to continue the presentation, switch between slides or open any other application without the help of a system operator or without going near the PC. The two days exhibit of innovative projects, full of knowledge imbued with various contacts, ideas, advices and interactions with industrialists ended with a glittering award ceremony fueled with encouragement and amusement among participants and audiences.